Giving a major setback to the Gorkha Janmukti Morcha, more than 500 voluntary teachers owing allegiance to the party today joined the hill Trinamool Congress, giving the latter a welcome boost ahead of the municipality election. Officially, there are about 515 teachers employed voluntarily since more than a decade in the junior, high and higher secondary schools in the area administered by the Gorkhaland Territorial Administration. This teacher group, under the aegis of the Janmukti Insecure Teachers' Organisation (JISTO), was one of the frontal organisations of the GJM. Last year, several of these voluntary teachers formed a Movement Committee that was entrusted to take forward the demand for their regularisation, which got them on the wrong side of the GJM. 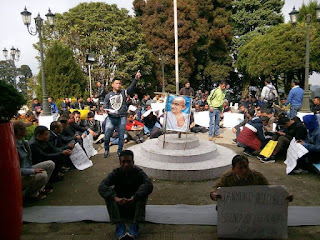 In July of this year, the GJM disbanded the committee, much to the annoyance of the members who then chose to form the Secondary Temporary Teachers' Organisation (STTO) even though the JISTO remains functional. And today, more than 500 members of the STTO received the TMC flag in Chowrastha from senior party leaders in what could be seen as a show of disgruntlement. The STTO argument is simple: they would side with the political party that takes up their cause to the conclusion and they are of the opinion that the TMC would be their saviour. “We have said earlier too that we would side with the party that helps achieve our demand. The GJM has lied to us all along on the regularisation issue and now we have no faith in the party. But after meeting chief minister Mamata Banerjee in September, the process for regularization has started as promised by her. We have joined the TMC formally to show our gratitude to the chief minister and her party,” said Amit Gurung, the STTO president. He was also critical of the GJM claim that the 390 vacant posts would be filled up as recently announced by GJM general secretary Roshan Giri, after he reportedly spoke over the phone with state education minister Partha Chatterjee. “The GJM is lying about the number of vacant posts in schools under the GTA. Giri, who is in-charge of the education department, has said there are 390 posts and they will be filled up by the GTA. But in 2013 there were 504 vacant posts, and that has now increased with several teachers retiring. If the GTA has the power to appoint as claimed by Giri, why were we not recruited earlier?" questioned Gurung. The SSTO president was referring to the statement by Giri on December 1 where he claimed he had had a telephonic conversation with the state education minister who had assured the state government would first fill up the vacancies from among the voluntary teachers who have been demanding permanent employment. The hill TMC today organised a rally and a public meeting in Darjeeling town where hill TMC president Rajen Mukhia said, “Until now the voluntary teachers had not got justice despite having worked hard. The GJM has not done anything for them in all these years and only used them politically. Our chief minister, on the other hand, has assured that the problems of the voluntary teachers would be resolved. The credit is wrongly being taken by the GJM as far as the state government's assurance is concerned."